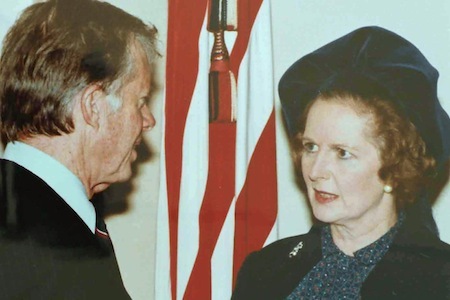 Margaret Thatcher and Jimmy Carter: Political BFFs? Lee P. Ruddin lives in England. He was roundup editor for HNN between 2008 and 2013. He is a student at Cambridge University. Ronald Reagan and Margaret Thatcher are commonly portrayed in the media as close political and ideological allies. Both were conservatives who reinvigorated their parties and transformed politics in their respective countries, both took on the entrenched welfare state (Thatcher moreso than Reagan, but then the British welfare state was larger and more politically popular), and both were firm anti-communists.The "special relationship" between the United States and Great Britain never seemed more special when Reagan and Thatcher were in office. But it's worth remembering that Thatcher, who became prime minister in May 1979, nearly two years before Ronald Reagan was inaugurated as the fortieth president. So what was the relationship like between Thatcher and President Jimmy Carter? Surprisingly good -- probably better, in fact, than the relationship between Thatcher and Reagan, which historians and British and American officials have actually characterized as "difficult," especially over the Falkland Islands war. Had Carter been re-elected in 1980, not only would the U.S. have been less supportive of the military junta in Buenos Aires -- and hence less damage would have been done in the relationship between the White House and Downing Street. Committed to rolling back communism through an offensive Cold War strategy, few were surprised, says Richard Aldous,a British historian at Bard College, that Reagan "vigorously pursued a U.S.-Argentine alliance from the outset." His administration wasted no time at all in announcing that it would end the military junta’s trade isolation, as well as ending official criticism of Argentina's human rights record. The appointment of neoconservative Jeane Kirkpatrick as ambassador to the United Nations provided further comfort to authoritarians in the region, but it was the actions of a future UN ambassador, General Vernon Walters, who helped ensure that hemispheric interests clashed with Atlantic ones. What the then-deputy chief of staff Mike Deaver failed to comprehend when snorting such a remark is that Carter’s hemispheric policy (which, unlike Reagan’s, did not regard the region as “the most important place in the world”) ensured he would not have needed to mend fences with Britain since trans-Atlantic ties would have been in no need of repair. Carter, the committed human rights advocate, would not have ended criticism of the junta's human rights record, and would have remained committed to the self-determination of the Falkland Islands. The job of an historian is not only to know that an event happened, but to know why it happened. As such, historians ought to be open to thinking counterfactually and to reimagine the past by creatively examining the significance of events and decisions taken. "[I]t is a logical necessity when asking questions about causation to pose 'but for' questions," Niall Ferguson posits, "and to try to imagine what would have happened if our supposed cause had been absent." The "but for" question here is: would there have been an Anglo-American diplomatic spat at the outset of the Falklands conflict had Carter served a second term? I believe the answer to be no since, absent the cause (Reagan and his neocon officials), the Carter administration would have continued, post-1980, to condemn the Argentine military junta for state-sanctioned human rights abuses. The State Department would also have continued to maintain close relations with the Foreign Office, post-1980, not least for the latter’s diplomatic efforts on behalf of the former at the UN in the aftermath of Soviet troops crossing the border into Afghanistan. Let us now refer to the historical evidence on which I base my counterfactual claim. There is much agreement on the degree to which Carter practiced what he preached on human rights during the first two years of his term. Entering the Oval Office at the height of Argentina’s "Dirty War," the commander-in-chief waged a relatively clean anti-communist battle by placing a premium on pro-democracy movements; his administration did this by slashing military aid to the junta from $48 million to $15 million and in 1978 by rejecting over two hundred license requests for the sale of more than $100 million in military equipment. The "institutionalization of human rights in U.S. foreign policy" not only "reflected the Georgian’s religious beliefs and moralism," says William Michael Schmidli in a Diplomatic History "but was also a savvy recognition of the national mood in the post-Vietnam, post-Watergate era." Carter’s rejection of "pleas" to intervene "to save ... dictators and long-time allies of the [U.S.]" is reason enough, says David F. Schmitz, author of The United States and Right-Wing Dictatorships, to conclude that the aforementioned, conventional thesis is seriously flawed. Carter remained committed to a human rights policy at a time when others behaved as though they had the right to act inhumanely, so there is little reason to believe U.S. policymakers would have adopted a “neutral” stance at the outset of the Falklands war. Granted, Thatcher was unable to prevent athletes from crossing the Iron Curtain to compete at the 1980 Moscow Olympics. Yet Thatcher’s "pivotal role [in] fulfilling" Carter’s "desire for an anti-Soviet [U.N.] resolution [demanding the withdrawal of troops from Afghanistan]," says Daniel James Lahey in Cold War History (2013), bought her much political capital with the Carter White House. The fact that her efforts contributed towards what the Washington Post characterized as “Moscow’s most stunning diplomatic defeat since the world condemned its 1956 invasion of Hungary,” only makes the counterfactual claim that Atlantic interests would have trumped hemispheric ones throughout the Falklands conflict all the more plausible. I would like to thank Mr. Lahey for kindly forwarding on a version of his thought-provoking article.